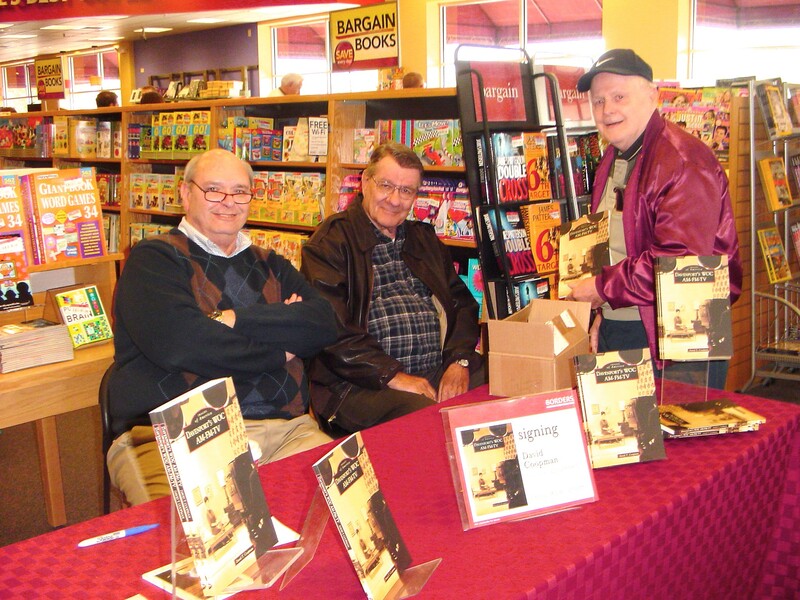 Dave Coopman, left, shown May 8 at a signing session for his latest book at Border's in Davenport. Stopping by were retired WOC-TV staffers Don Rhyne, center, and Ed Zack. Photo courtesy of Jon Book. This latest effort, just printed, is called “Davenport’s WOC AM-FM-TV.” I haven’t yet read it, but if it’s anything like Dave’s first three books, it’s a must-have for a Quad-Cities broadcast junkie or anyone who gives a hoot about history. I have some WOC memorabilia that I provided to Dave for copying and possible inclusion in the book. And I’m sure there are a good deal of additional photos and exhibits to supplement the text. I can’t wait to read it. Dave, a former broadcaster and high school English teacher, had a signing recently at Border’s in Davenport, where you should be able to find a copy for purchase.